This is a half day workshop in June being delivered in regional Victoria. The new Urban Water Cycle Planning Guide is an exciting new tool developed for the Barwon Region to help urban developers, consultants and planners incorporate Whole of Water Cycle Management principles into new urban developments. This session will introduce you to the Guide, see first-hand how it works and allow you to explore how it could be adapted for your Region. 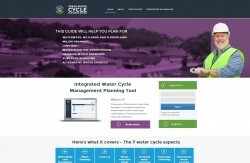 Developed by the Barwon Region IWCM Network, with support from the Smart Water Fund, the Guide covers all aspects of water cycle management as they relate to a new development and provides instructions on how to proceed though the planning process on these matters. By working with the relevant agencies and incorporating IWCM principles early in the process, developers and consultants can save time, resources and money. Whilst some of the content of the Guide is currently specific to the Barwon region, the functionality of the Guide has been designed to be applicable state-wide. The workshop will be facilitated by Clearwater and project team members from the Barwon Region IWCM Network. The session will start with an introduction to the concepts of urban water cycle and its application in new developments. The session will explain how the Guide works and the steps involved in developing an IWCM plan for residential developments through a real life case study. The workshop will also provide an opportunity for networking amongst participants, providing a platform for closer working relationships between developers, consultants and agency staff. Lunch will be provided at the start of the workshop and a discussion session held at the end to share ideas on how the Guide could be best applied in your region. This session is primarily designed for council and water corporation who are looking for tools to assist with IWCM planning that could be adapted for their region. Developers and consultants are also welcome to attend, to preview a tool that could be adapted for use outside the Barwon region and potentially be made available for their use in future. Participants are welcome to a laptop (wireless enabled) to access the Tool and have a go using it with the support of the project team. Fill out the details below to register your interest in this training on request.